The article plainly attempts to establish a connection between the widespread anti-Semitism in Europe in the last two centuries, which culminated in concentration camps and the Holocaust, and the Turkish President’s criticism of George Soros. However, as a matter of fact, President Erdogan’s Justice and Development Party (AK Party), which has been ruling the country since 2002, has spent great effort to improve the rights of non-Muslim communities in Turkey, including the Jewish community. - The Jewish community celebrated Hanukkah publicly for the first time in 2015 in modern Turkish republic's 95-year history. Please click here for the details of the event. - The Great Synagogue of Edirne in Turkey, or Kal Kados Ha Gadol, was reopened after 46 years following a five-year government-sponsored restoration in 2015. The synagogue hosted its first wedding ceremony one year after reopening. To watch the ceremony, please click here. - Turkish government paved the way for the free allocation of worship places such as synagogues and churches to non-Muslim foundations in last July. - In 2015, Turkey for the first time hosted a commemoration event for Jews killed in Struma ship disaster of 1942, bonding with the Jewish community in the country over “shared pain” according to a government minister at the event. The commemoration event continued to be officially issued in the following years. - The Turkish government approved a law in 2008 to return properties confiscated in the past by the state to non-Muslim foundations. 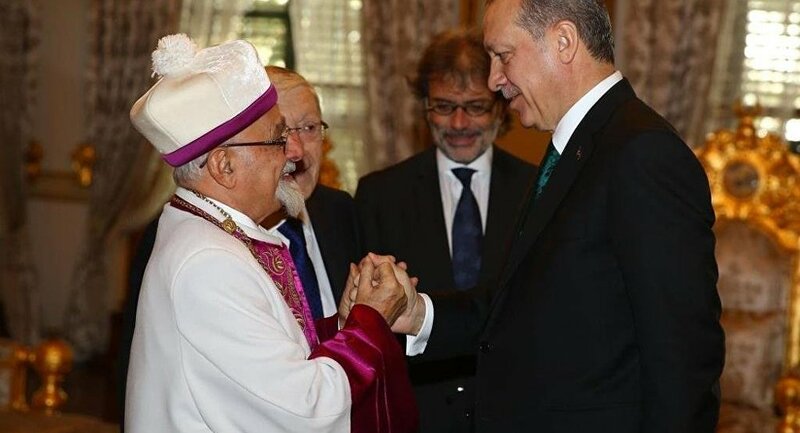 - When President Erdogan received representatives of the Turkish Jewish Community in 2016, the Chief Rabbi of Turkey, Isaak Haleva expressed his gratitude for the positive steps taken in recent years regarding the rights of non-Muslim communities in Turkey. In addition to these democratic achievements, on 31 July 2018, Turkey’s non-Muslim community leaders, including Turkey’s Chief Rabbi Isaak Haleva, issued a joint declaration which said they enjoy religious freedom in Turkey and denied claims that Turkish non-Muslims are under “pressure”.